Line 4 of the Wuhan Metro will be the final of my Wuhan inspired 'On The Metro' blog theme, the network keeps on expanding so who knows what the future might bring? Anyway, stretching from Wuhan Railway Station all the way to Huangjinkou, it's safe to say that Line 4 is a mighty big metro line from the original Wuhan four, being one of the first metro lines built. Go WH! Beginning from Line 4's northern terminus at Wuhan Railway Station in Wuhan's Qingshan district I have used this line to reach one of the cities high speed rail stations. Connecting Wuhan with cities such as Guangzhou, Shenzhen, Shanghai and the capital, Beijing it's a very important station along Wuhan Metro's Line 4 system. 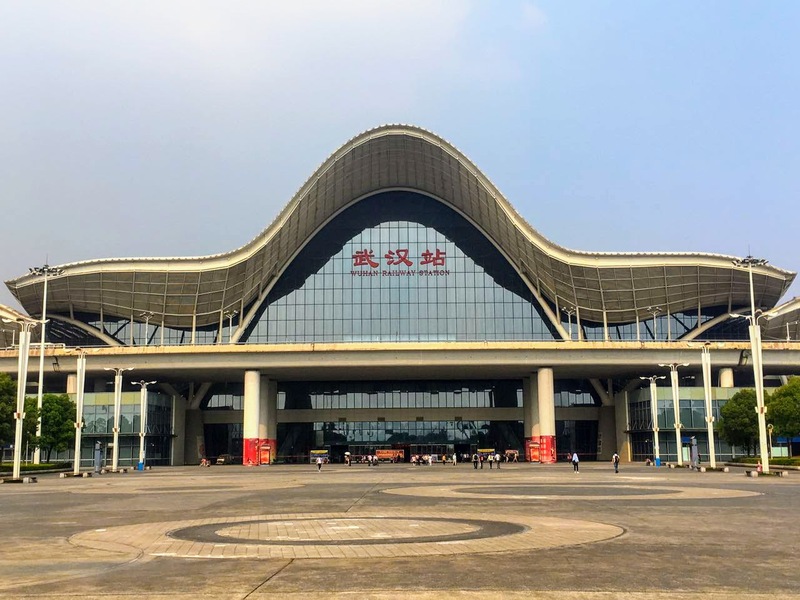 It was a god send when I arrived back into Wuhan Station from Shenyang as that twelve hour high speed service left me feeling drained. Yes, after interchanging with Line 2 at Zhongnan Road Station it's a practical and sometimes cheaper option to reach that high speed rail connection from my Optics Valley Square location. 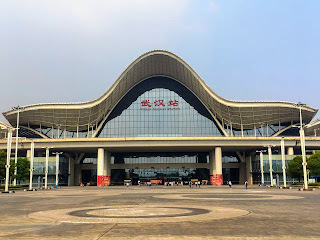 I recently made the trip up to Wuhan Railway Station to collect my tickets for my upcoming trips to Hefei, Nanchang and Enshi to avoid any pesky queues or sights of pre-travel pandemonium on the day of travel. Please, take me to Shanghai Hongqiao Station, now! I haven't stopped at the stations within Line 4's Qingshan district stretch but there doesn't seem to much going on, a lot of that area is being developed into residential and business areas to make us of in the future. Wanting to rediscover the East Lake Scenic Area during my 2016 Summer break I took a chance on Dongting Station as the station that will serve Hubei Provincial Museum hasn't been built yet, nevertheless I took the wrong turn at first but getting it together I found East Lake and that museum without stress. Metro expansion around Wuhan's East Lake Area is slowly happening but I'll be long out of Wuhan when Line 8 makes an appearance within that part of Hongshan district. More recently myself and Fiona walked for miles across the walkways of East Lake from its Guanggu beginning at Mo Mountain to meet Tieji Road, so I may have told a white lie because I have frequented at least two Qingshan district stations along Wuhan Metro's Line 4. Yass, Qing Shan Kou! When I first got to Wuhan I found a diamond in the rough, well that was Marks & Spencer's on Han Street, how those Percy Pigs tasted beyond amazing! A few stops down the line from Dongting, Chuhe Hanjie Station can be found with all of its shimmering lights, from shopping to its own glittering theatre it's a genuinely great place to experience. Rocking up to the clubs and bars along Han Street has to be done, I've been suitably inebriated to say the very least! With a change in schools during August 2015 I was enabled to spend more than just stolen evenings along the Chu River, Line 4's got a lot going for itself! Don't dare close M&S because I need some home comforts! Yes, I'll say Chu River and Han Street is definitely worth stopping by! Getting ever closer to the Wuchang side of the mighty Yangtze River, Line 4 makes the interchange with Line 2 at Zhongnan Road and Hongshan Square, more about that Central South Road though! With its towering office blocks and many shopping opportunities I've always ended back at Zhongnan Road even if I didn't intend to in the first place. I stumbled out of this metro stop in hot pursuit of Wuchang's Changchun Taoist Temple, following Wuluo Road was easy enough but I was new to China so at that time I stupidly trusted a Google Map! Meeting with a huge intersection of traffic I hold a special place with that noise and crazy as its near to where a dear friend lives. Qingshan district's own railway station might be a far but Line 4's got this! Now, no shady business! Oh yes, that was an order! Picking up Wuhan Metro at Shouyi Road Station led me to the Wuchang Uprising Memorial of 1911, an important site that I adored before a profound development occurred surrounding my new teaching life in Wuhan. The former headquarters where the mastermind, Dr. Sun Yat-sen worked to bring those dynasties down and beckon a new era for China during the 1910's. Just one stop heading west from Wuchang Railway Station I found my way out of the station to that rebellious piece of Wuhan history without a problem. Oh, that was definitely a time before I had discovered Baidu Maps! As mentioned before Zhongnan Road holds the key to Guanggu Square through its interchange station, I was able to reach the Wuchang Uprising Memorial of 1911 within thirty minutes from Line 2's Optics Valley Square Station. Did I mention before that on the whole China's metro systems are the cleanest I've ever seen! Yass, WUH! Taking the shine away from Wuhan's focal point, I wanted to give Dr. Sun Yat-sen's former yard some attention rather than the next place mentioned. Still served by Shouyi Road Station alone Line 4 of the Wuhan Metro, standing behind the Uprising Memorial is the Yellow Crane Tower, shamefully it doesn't have better transport links to the supposed most visited attraction in the city but the short walk from that station wasn't so bad. Sticking within that area I found myself at a familiar sight, the smells of Hubu Alley were present in the air as I approached that corner of town, that day it was roasting hot so the smells didn't entice me whatsoever! It's no secret that Wuhan Metro's Line 4 may stretch over the Yangtze River to Hanyang but I'm going to serve those sides of Hanyang in a different fashion at another time. From the supersonic high speed Wuhan Railway Station to the pedestrian feel of Fuxing Road I have made my best efforts to use Line 4! Oh Hanyang, get on with your flow!